Sorry for the delay in posting, been celebrating the start of the summer holidays! Seven weeks to fill with drawing, photography, making clothes, reading, traveling, seeing friends, and of course, blogging! These are some more photos from the vintage shoot I did a while back. Probably two of the most glamorous dresses I've ever had the good fortune to wear! Mind you, I very nearly couldn't extricate myself from the black dress, it was that tight! Although, I'm not sure it would be such a bad thing to be forced to wear it permanently. 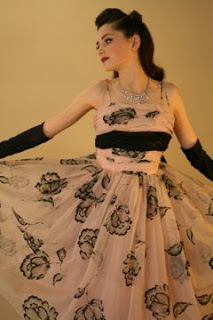 The second dress is a gorgeous pink and black frothy chiffon 50's prom dress. The first is a slightly strange hybrid of black sequins, netting and antique lace. It actually looked like 2 dresses sewn together. Dresses and all accessories courtesy of Berties Vintage. You look absolutely stunning!!!! These dresses are gorgeous! Totally charming and so beautiful....i bet you just wanted to parade around in these dresses all day! I love the rose print on the pink chiffon!! Its so hard to find fabric like that these days. those dresses are amazing - so detailed! you look stunning, i love how you've done your make up and your hair to keep to the vintage theme too! Your summer sounds ready toi go go go! You shoudl set up some kind of prom for wannabee '50s kids(this is me)! amazing! these dresses are gorg. as are you! need to see more modeling shots, these are great! I'm obsessed with Audrey Hepburn, yeah I love those movies too, I also like Paris when it sizzles! Absolutely lovely! Those dresses compliment you immensely. these photos are absolutely beautiful! the black dress is so gorgeous! I really love the pink one! Yay for summer! I adore the 2nd dress. It has such a perfect 50s shape and a really interesting print. wonderful dresses and wonderful woman ! Sorry I don't know where the shoot is from.. I tried to look it up but I can't find it. vintage bring us another way of life!